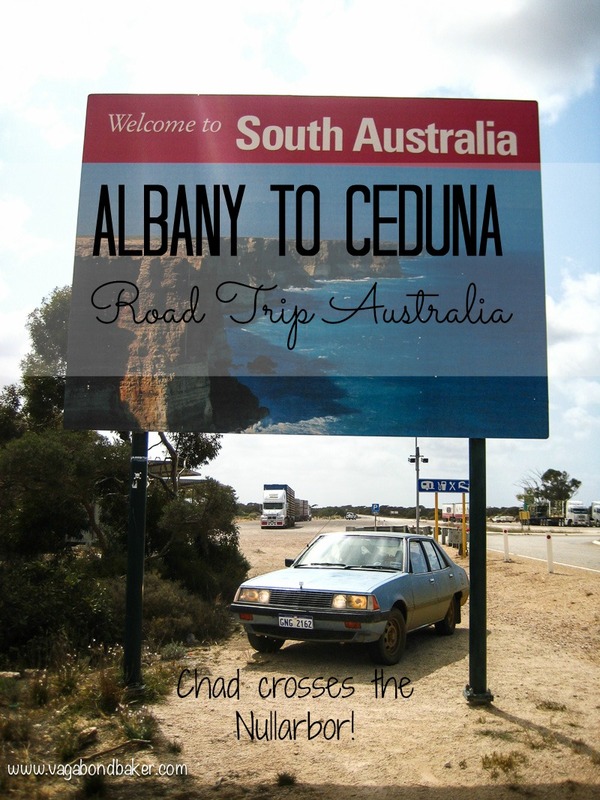 This next leg of our half-circumnavigation of Australia took us from Albany in south Western Australia to Ceduna just over the border in South Australia. One thousand and fifteen kilometres in ten days, across the infamous Nullarbor plain, and yet checking our map we still weren’t half way across. It’s times like this when you truly gauge how extraordinarily big Australia really is! In those ten days we encountered space debris, picked up a hitch-hiking Golden Retriever, got a certificate for crossing the Nullarbor and had the most surreal experience of been woken in the night by a whale in a storm! 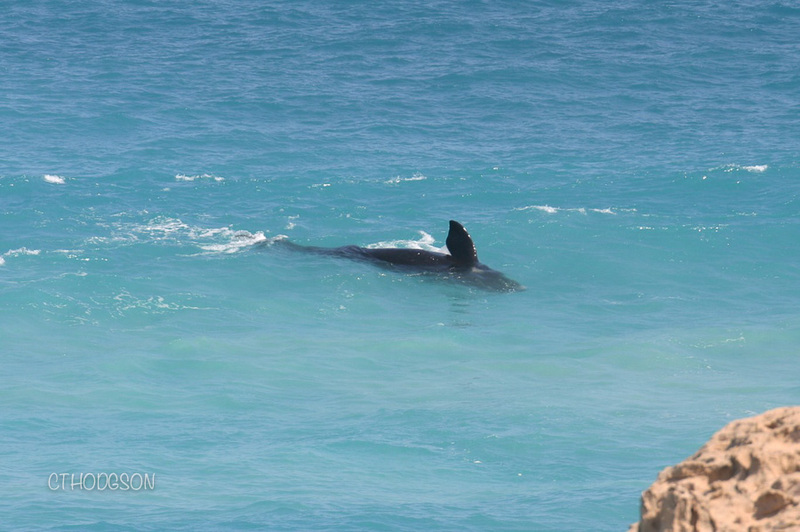 In fact, we saw more whales in this stretch of coastline than we did anywhere else in Australia and while the weather was rather inclement – wet, wild and cold – it was joy drive. In the last Road Trip Australia post we had just arrived into Albany. We stayed on a large (Big 4) campsite here, pitching our tent early in the day to dry it out – our sleeping bags were also hung up as they had become saturated at the bottom from the previous wet night. Leaving our stuff drying in the sunny breeze we set off to explore. 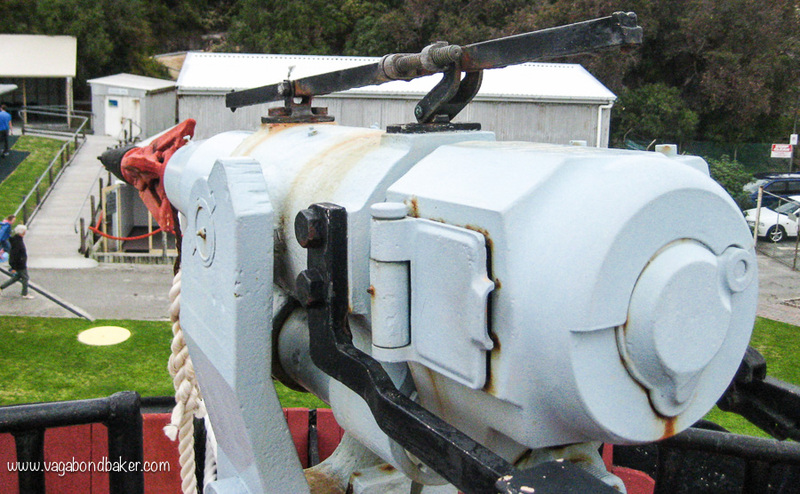 We drove down to Frenchman Bay, to the Torndirrup National Park and parked at Whalers Bay – no prizes for guessing what happened here in the past. 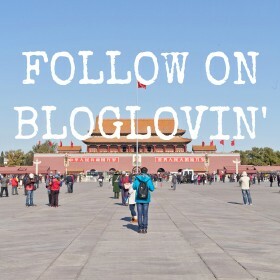 More of that in a bit. Chris was on a mission to find a carnivorous plant that grows wild in the area: the Albany Pitcher Plant and leaflets for this park listed them as being here, yet we were unsuccessful. 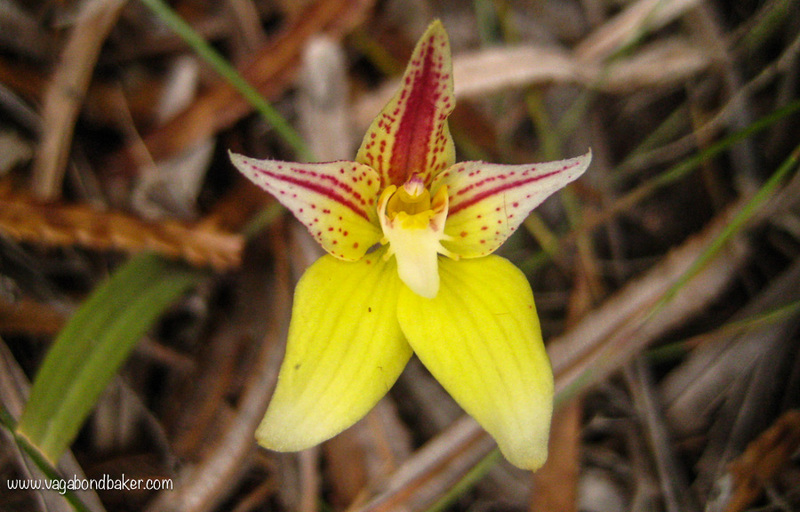 However, the walk we took down to the Vancouver headland was very pretty with beautiful orchids and mosses. A large pod of dolphins frolicked in the crystal clear water below the headland, we took the trail down to the beach but the wind was so strong the sand was being blown everywhere, not a pleasant experience. 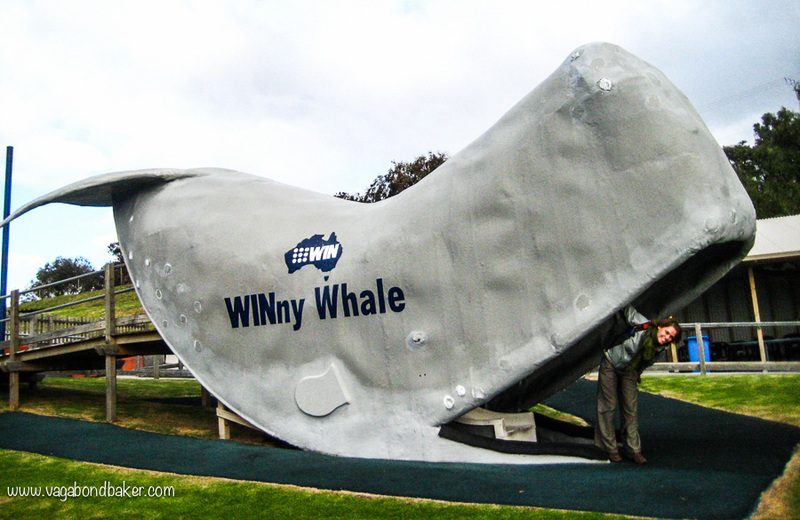 Albany was a major player in the whaling industry and its old whaling station has been turned into a tourist attraction: Whale World. Whale World makes no bones about what it used to be, in places it is pretty graphic yet it is very interesting. Our entry fee included a guided tour, where we joined a tour bus-load of people to walk around the factory with an informative guide. 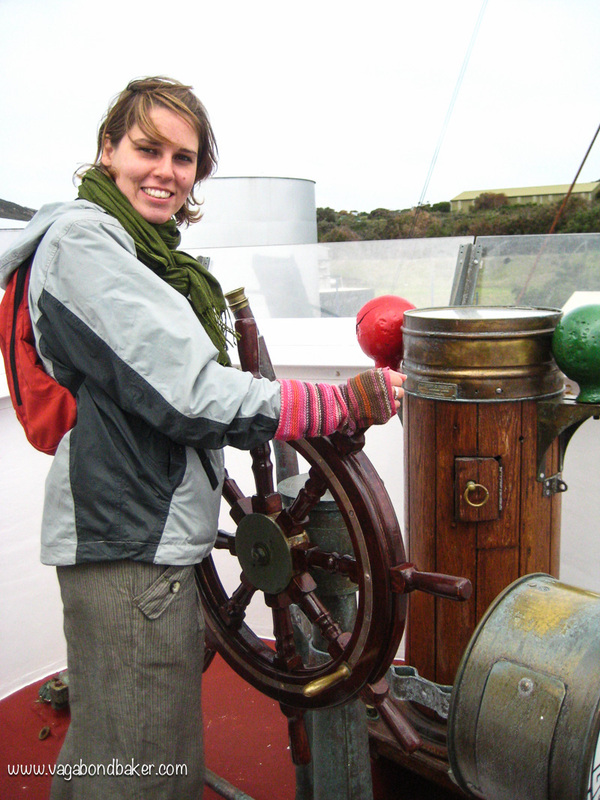 We were free to explore the whaling ship – the Cheynes IV – by ourselves, which brought us eye-wateringly close to the massive harpoons used to catch the beautiful creatures. The vast tanks which used to hold the refined whale oil – the purpose of the harvest – had been converted into exhibition space and we watched videos about the process in there. Whale World, despite its grim history now promotes environmental awareness: we learnt that humpback whales have almost recovered to pre-hunting figures, which is amazing. 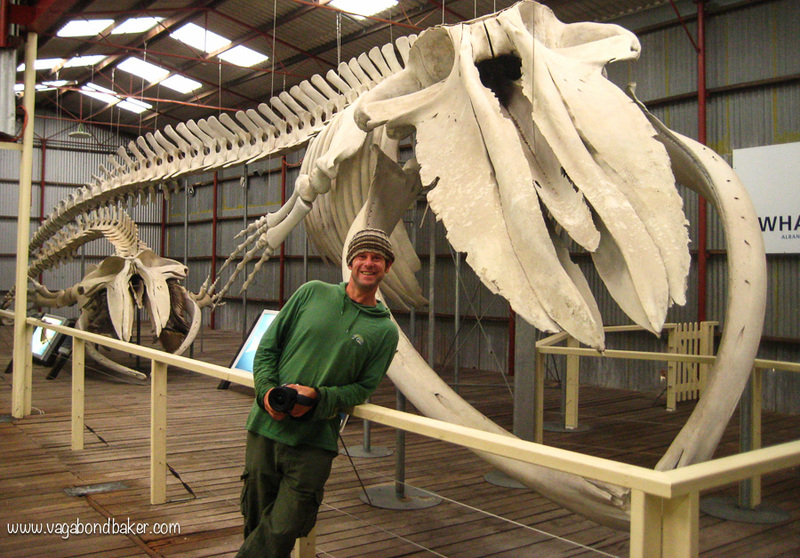 The mighty blue whales (not hunted by this facility) however are sadly still critically endangered. Before we left Albany updated my tired wardrobe (9 months: one bag!) in the ‘op shops’ and second hand shops of Albany: and came away with a pair of boots and some jeans (oh boy, I’d been missing jeans!) for less that $5! On the morning of leaving I totally forgot that my laptop was charging in the campsite kitchen, we’d hardly slept as it had been such a windy night, the rain lashing our tiny tent. We only realised when we got to a cafe to use the internet! Luckily it was still where we’d left it. That night we camped a little further along the coast at a free campsite called Betty’s Beach, and I doubt I’ll forget this night as long as I live! The weather was still pretty wild when we arrived, there were a few old tin shacks dotted on the side of the wide bay, one had a large ‘car port’ for want of a better description and we opted to pitch our tent inside it for shelter after having such a bad night the previous night. 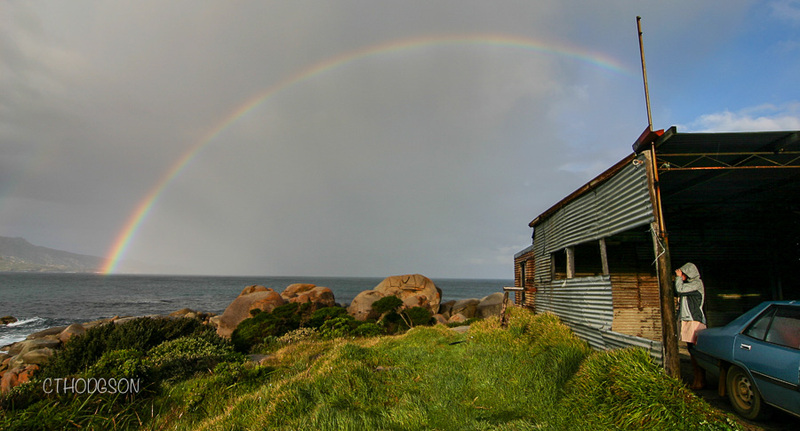 Our German friends Lotte and Hike arrived in their vintage VW camper van just as a spectacular rainbow graced the bay. That evening we sat around their petrol lamp in the shelter of the, er, shelter, and caught up with each other’s travels. We were joined at one point by a local guy who came strolling over, beer can in hand, to chat. I swear to God every third word he used was the F word, he was cheery and enthusiastic enough but his language was atrocious! The later it got the worse the weather deteriorated, rain thundered down, streaming off the roof of the shelter, and the wind howled though the tin buildings lifting and rattling the corrugated roof panels. I lay in fear that they would come tumbling down, slicing us in half! Oh how the mind wanders in the darkness! Eventually it calmed and I must have drifted off. Next thing I know I’m awake again, it’s still completely dark, and there is a weird sound coming from the sea. I prodded Chris “there is something out there”. We sat and listened, what was it? 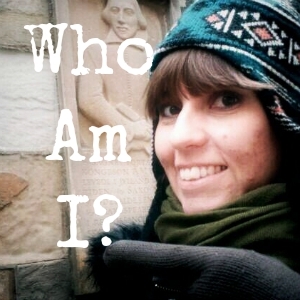 It sounded like deep dodgy-phonecall breathing, but very irregular and drawn-out. Then we realised, it was a whale breathing! The whale and her calf must have been in the water just beyond the edge of the shelter, it was the most extraordinary thing! When we rose early the next morning there was no sign of either of them, but later on they appeared at the far side of the bay again while we were all eating breakfast. We all drove out to the far beach to try to get a closer look yet by the time we’d got round there the whales had moved around the bay and were now frolicking, repeatedly breaching, right in front of the campsite! Gutting! 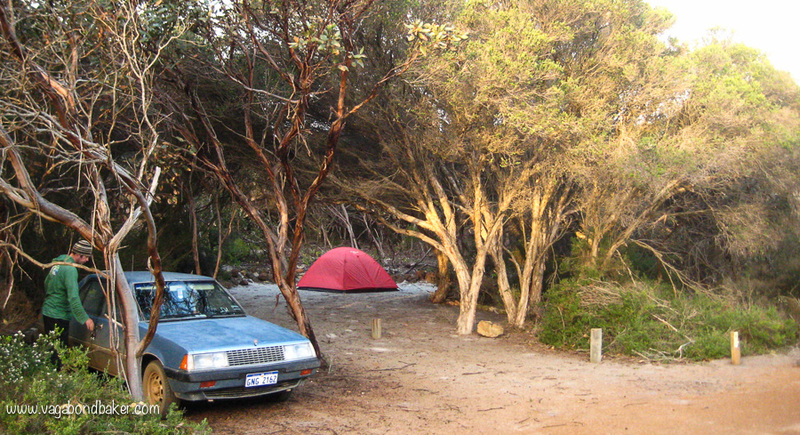 Continuing along the coast we spent a night in Fitzgerald National Park, camped near the beach at Ann’s Point. The roads in the park were shakingly corrugated and Chad the car crept along, red ridged roads fringed with large robust-looking plants. We learnt later they were Royal Hakea, only found here. Driving down towards the camp we could see two whales in the bay, after pitching our tent we wandered onto the beach where we watched even more whales: females with small calves. From this close vantage point we could really grasp their size: the adults around ten metres. 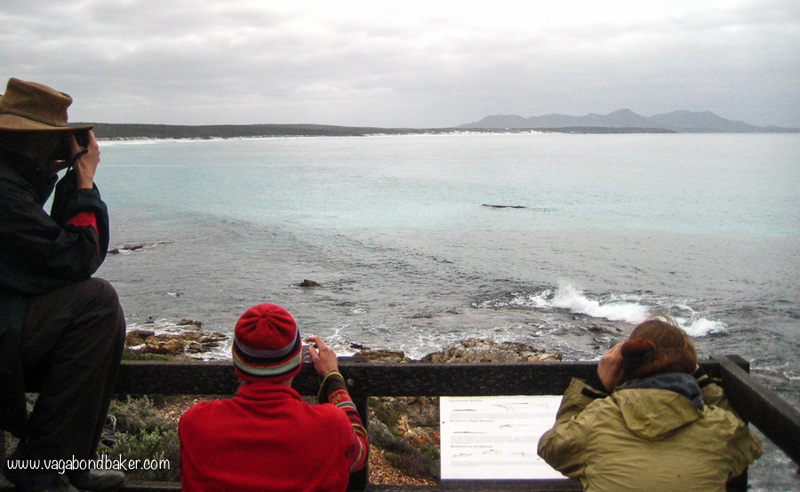 We spent more time with Lotte and Hike, joining them the following day at a whale watching platform in the park. A whale and her calf came towards us at one point and we were able to get really good look at them. 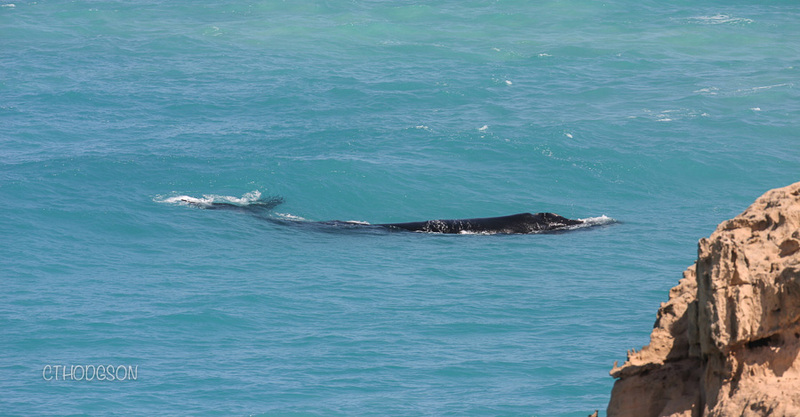 These are Southern Right Whales –right because they were the right ones to catch during whaling times – identifiable by their double blowhole and lack of dorsal fin, they have shorter pectoral fins compared to Humpback Whales. Saying our final goodbyes to our German friends –they were heading inland – our road trip continued. I managed to get a hot shower at the road house in Ravensthorpe and we spent the night further along the highway camped at Quagi Beach, a lovely sheltered public campsite for $2 each. At Esperance we stayed at Bathers Paradise Caravan Park and I did a whole load of laundry, the weather had cleared so our whole life was hung out on the lines to dry in the sunshine! The Esperance Museum is well worth a visit, especially to see the Skylab remnants. Skylab disintegrated over this corner of Australia in the 1970’s and burned up bits of space craft dropped from the sky above Esperance. They are now contained in a glass cabinet amongst many other quirky objects in the museum collection. This is an old school type museum, housed in an old railway shed. It’s cluttered with farm machinery, formaldehyde animals in jars, souvenirs from around the world dating from the 1920s and even a nineteenth century steam engine complete with carriage. Brilliant! 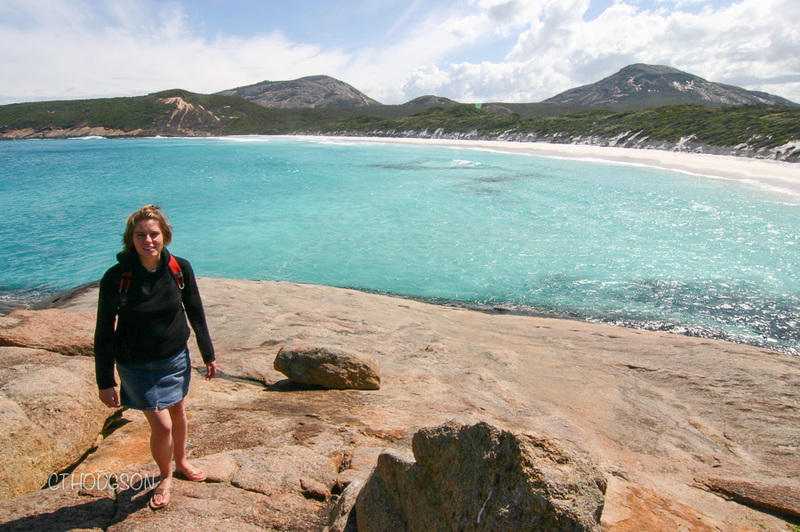 Two nights in Esperance then we moved on to the Cape Le Grande National Park. Driving over there the scenery was beautiful, a few low peaks rose up from the landscape, one had a ‘window’ at the top: Frenchman’s Peak. The coast was incredibly turquoise, deeper than I’d seen anywhere. 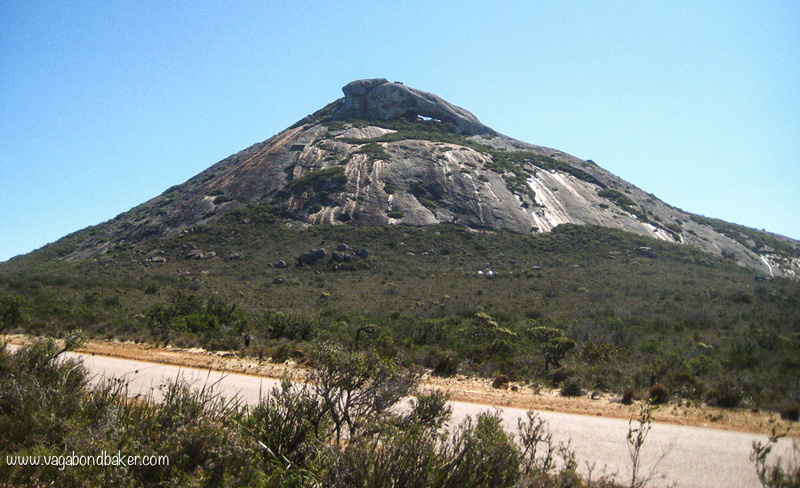 The following morning we climbed Frenchman’s peak, it was a steep old climb on basically a big lump of smooth granite and I found it hard going, tiring. My heart was thumping by the time we reached a big open cave near the top. 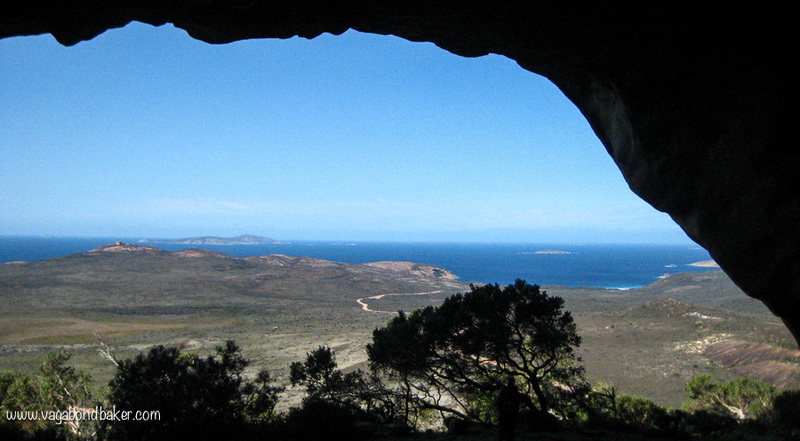 A little more climbing took us to nature’s window: another open cave with spectacular views of the turquoise coves below. We rewarded our efforts with fish and chips back in Esperance before filling the tank and hitting the road again. 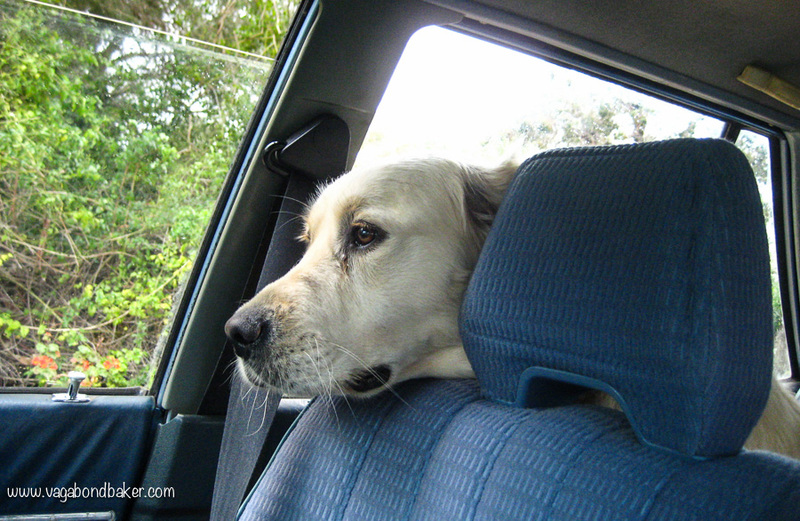 A few kilometres out of town we spotted a dog wandering lost along the edge of the highway. It was a gorgeous golden retriever. We pulled over and he came to us excitedly, he was so friendly. We decided to put him in the car and try to find where he’d come from. 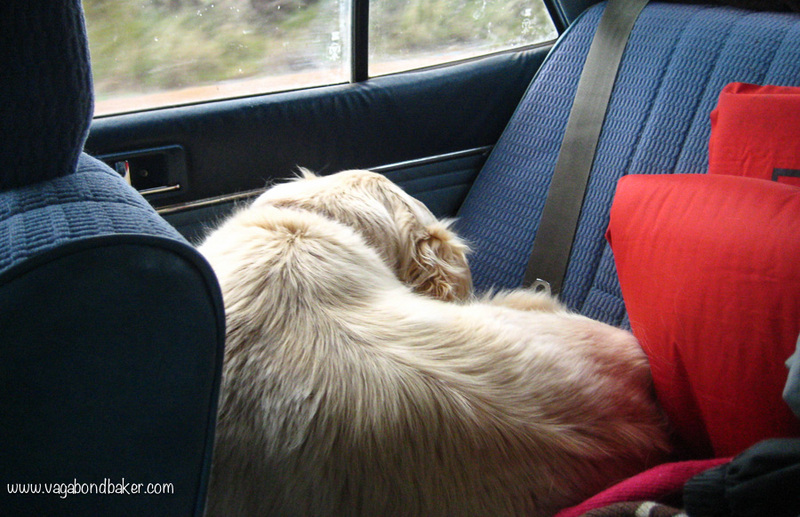 Opening the back door he hopped in without prompting and curled up on the back seat! We drove to a nearby house and enquired but they didn’t recognise him, and told us to contact the ranger in town. Back in Esperance we took him – we named him Michael – to the police station, where they called the ranger. We sat and fussed him in the car while we waited, I wished we could have kept him, he was in such good condition with a lovely collar, just no id tag. I’m sure he must belong to someone who was probably fretting. The last we saw of him was him jumping happily into the back of the rangers van. Good luck little Michael, good luck! Two hundred kilometres took us to Norseman for the night, to a bleak but clean caravan park then we set off the next morning along the Eyre Highway to cross the Nullarbor. Just turning onto the highway the car stalled, Chad momentarily lost power. Chris restarted him and he was fine, but it was a little worrying. 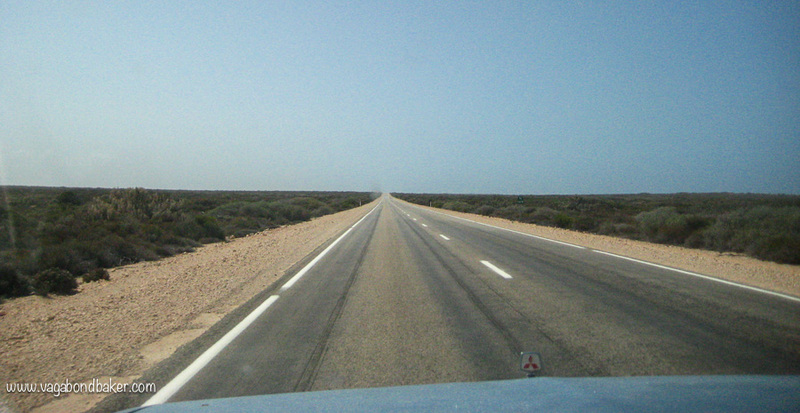 The next stretch of driving was to be the least populated of the trip: it wouldn’t do to break down on the Nullarbor. 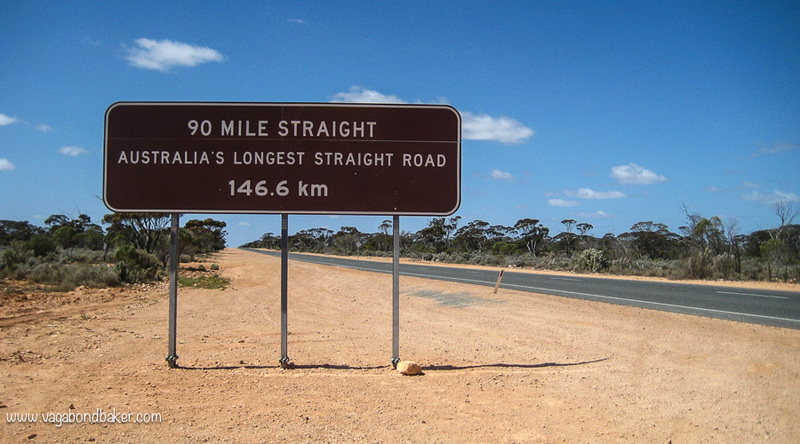 The Nullarbor is a vast treeless plain with half in Western Australia and the other in South Australia, a raised limestone sea bed – in fact it is the world’s largest single piece of limestone – and the highway skirts the bottom of the plain, next to the ocean for much of it. 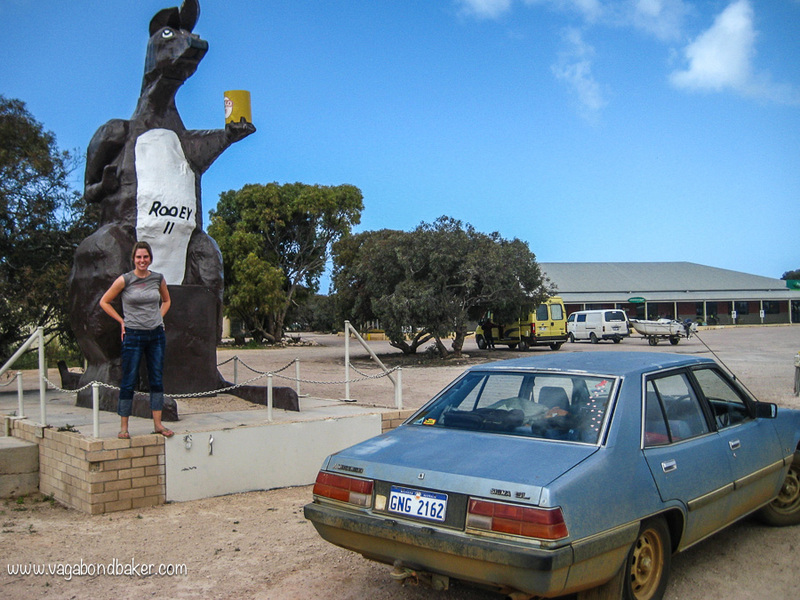 From Norseman to Ceduna in Southern Australia it is 1200 km of road, over a sparsely featured landscape dotted with the occasional road house. I was prepared for tedium but actually the route was far from featureless. I found the vista to subtly change as we moved through it and there were tourist spots en route to break up the journey. It took us one and a quarter hours to drive the ’90 mile straight’, which is rather a long stretch of the road to drive without bend or turn. At Caiguna we fuelled, both us and the car. 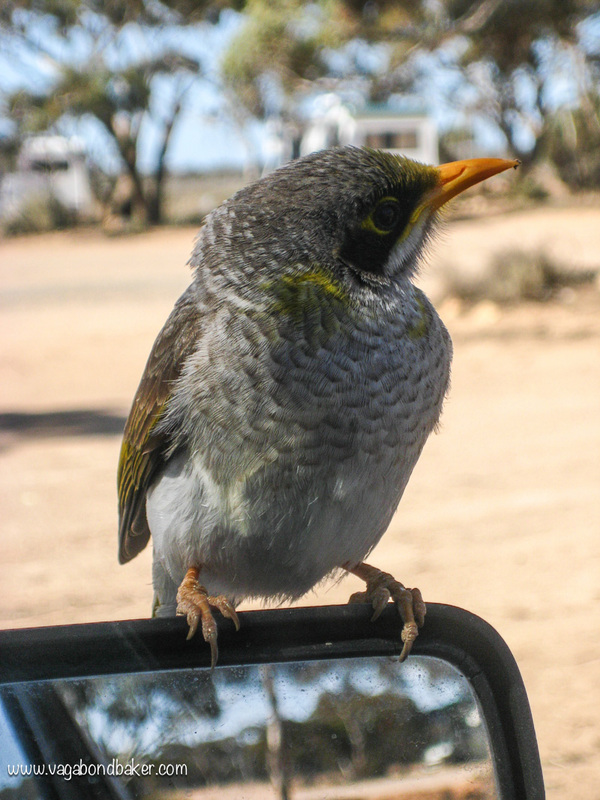 We were joined by some cheeky birds that peered at us perched on the wing mirrors, the windscreen wipers and the window sills. Nearby we stopped to see a blow hole: a metre wide circular hole that blew cold air up from caves below, it was a bit eerie. Continuing on to Madura, admiring the vast views over the plain we eventually ended the day’s driving at a free campsite – Moodini Bluff – some 30 kms on from Madura. Moodini Bluff gets the unfortunate prize for having the worst bush toilets of our trip. Someone must have emptied their chemical motorhome loo into it and it reeked to high heaven. An early start the next day, the sun was up and there was countless fresh road kill as we carried on heading east along the Eyre Highway across the Nullarbor plain. The cows and kangaroos don’t stand a chance with the mighty road trains that thunder though the night. If there is one smell I will remember from this epic road trip it is the smell of death, or rather the smell of slowly decomposing dead animals on the roadside! At Mundrabilla we put more fuel in the tank. It didn’t take too long to reach the border with South Australia and I had a sudden pang of sadness for leaving Western Australia. We stopped at a viewpoint overlooking the ocean, the water was calm and very blue, so pretty. We changed the clocks, we were now in a different time zone. Lunch was eaten, in the car, at the Head of Bight where there is a whale watching platform. It costs $15 (2015 – I checked) per person during whale nursing season (June to October) and there are boardwalks and platforms on the clifftop looking out over the bay. 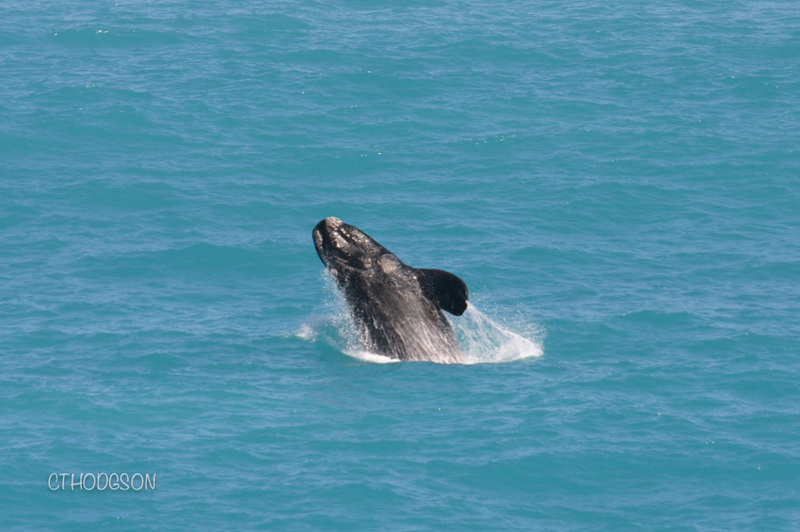 The southern right whales use the bay as a safe nursing area and many whales can be seen there during the season, mothers with calves. It was wonderful to see, they were so visible in the clear green waters below. The calves were very playful, spyhopping, mini breaching and tail slapping, it was adorable to watch. The rest of the afternoon was spent driving, with just a couple of road house stops for toilet breaks. 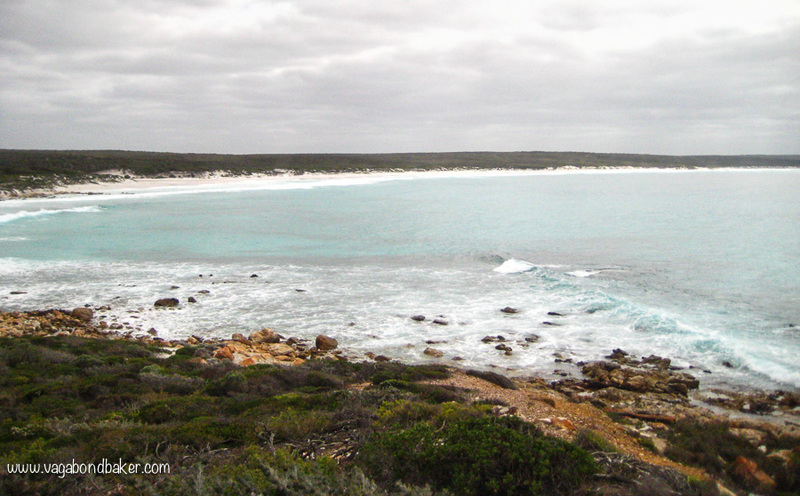 The sun began to creep down and we turned off the highway heading for Cactus Beach some 20 km off towards the coast. The landscape was suddenly fantastic, white dunes and blue lakes. The road became a narrow causeway between two very still lakes one of which was surreally pink – apparently due to the salinity of the water and some algae. 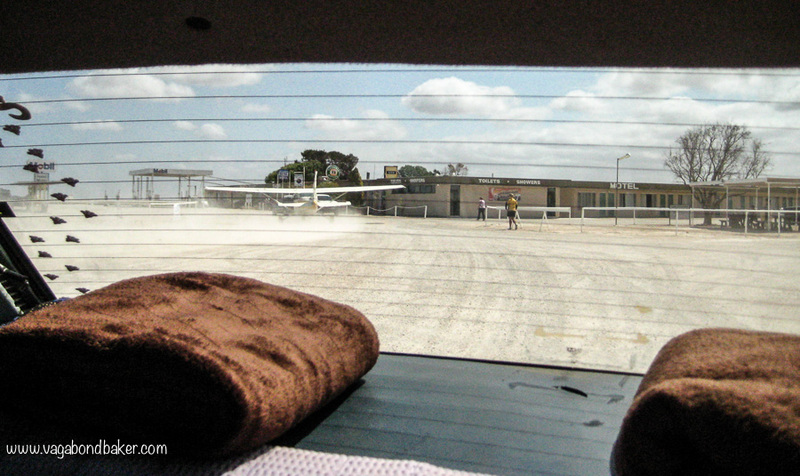 Cactus Beach is famed for its surfing, we simply made use of the fine campsite just behind it. 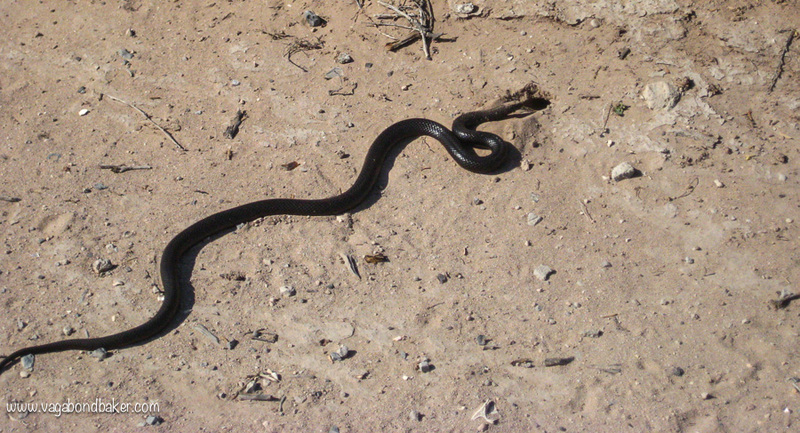 We watched a sleek black snake dig a hole into the sand while we ate our breakfast the following morning, it was fascinating to watch! Australian wildlife is so surprising, we often stopped to see reptiles sunning themselves on the road, like the shinglebacks who stuck out their blue tongues when you approached. I was desperately in need of a shower, it had been a couple of nights on the road and I was able to get one for a couple of dollars at the roadhouse in Penong when we stopped for fuel. I think this is the only fuel station where the vehicle behind us waiting to fuel up has been a plane! 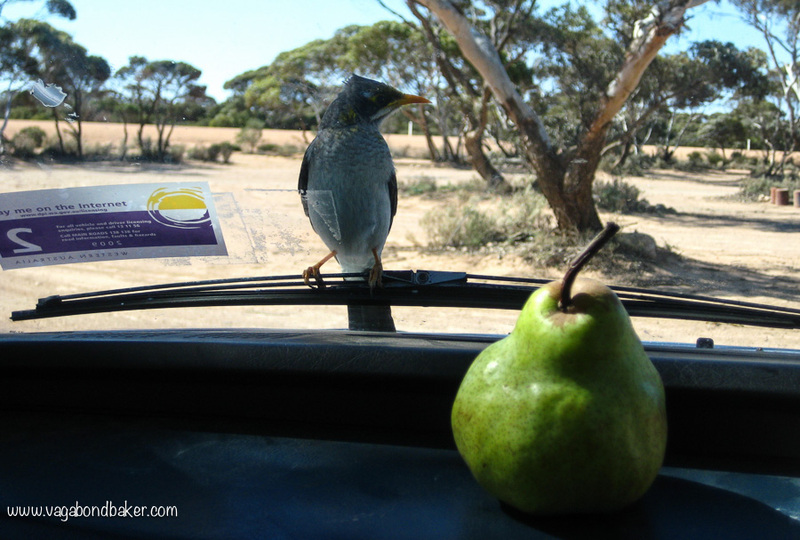 We arrived into Ceduna, passing through a quarantine checkpoint – our honey and died fruit was ok! Chad had done it, we had crossed the infamous Nullarbor with no troubles, that glitch just outside Norseman had been a one off thank goodness. At the Ceduna tourist information office Chad even got a certificate to prove he’d done it! Plane at the fuel station! 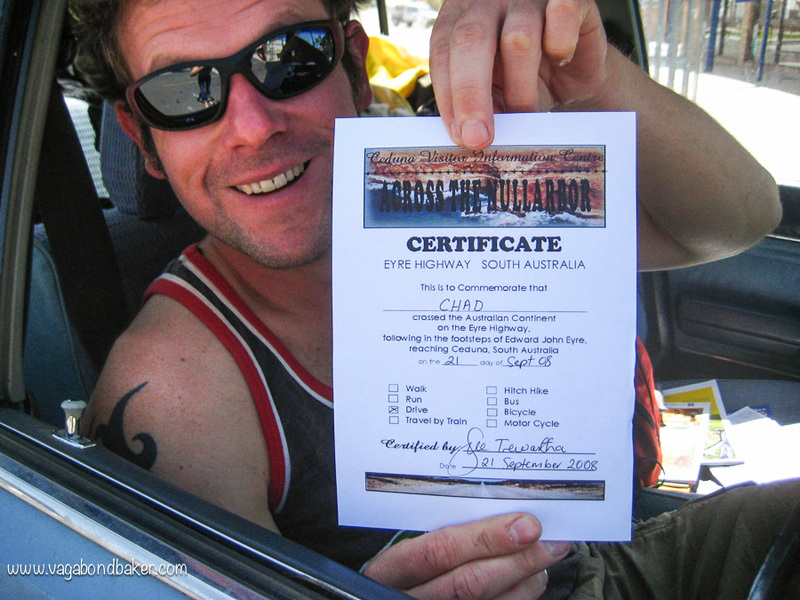 Chad’s certificate for crossing the Nullarbor! It had been a long, long drive from Albany and we’d covered a lot of kilometres in a week and a half. 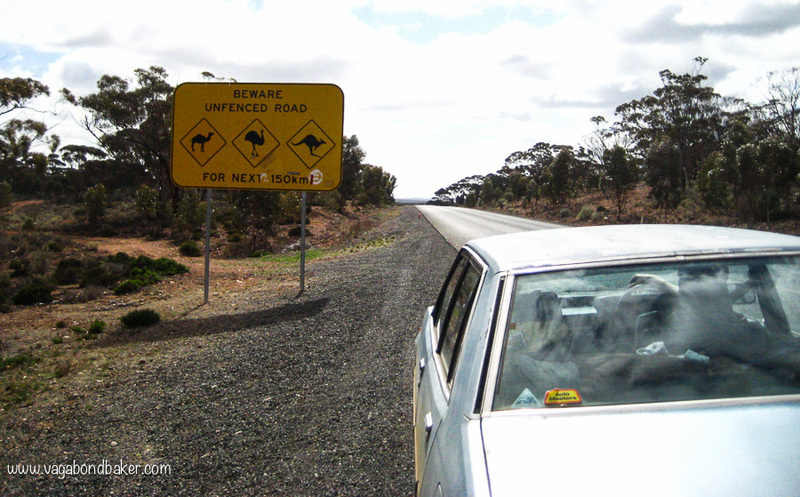 We were now in a different Australian state and there was much to explore……. 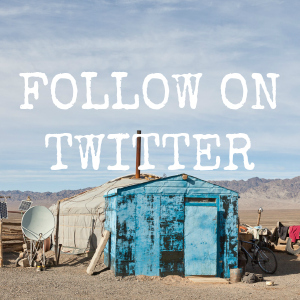 In the next leg of the journey our tiny tent is finally destroyed in a storm, with us in it, and we head inland to the Flinders Ranges: coming soon! 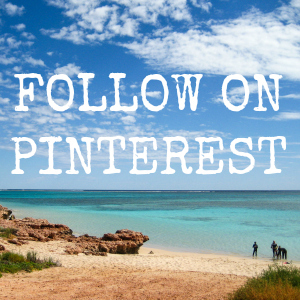 Have you crossed the Nullarbor, or are you planning to? I love the part about being awakened by the sound of a whale breathing! I’m sure I’ve never heard anyone mention that before! I’ve been on a few whale-watching trips but never been lucky enough so far to see whales breaching & frolicking. 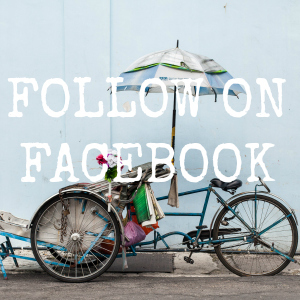 Really love your Australia posts – they have a nice nostalgic feel for them I guess because of the years gone by. It was so amazing Dave! I’m sure if you do more you will see it, I can’t imagine I’m that lucky that they don’t happen all that frequently! Yeah, they are a little nostalgic now, gosh it was 7 years ago!! Thanks Jayne! No, I don’t remember any burnt out vehicles, just dead cows! I loved this bit of the trip, we felt so adventurous despite the tarmac!